Librarian note: This record is for one of the three editions published with different covers and with ISBN 0-140-38572-X / 978-0-14-038572-4. The records are for the 1988 cover (this record), the 1995 cover, and the 2008 cover which is also the current in-print cover. The Outsiders is about two weeks in the life of a 14-year-old boy. The novel tells the story of Ponyboy Cur Librarian note: This record is for one of the three editions published with different covers and with ISBN 0-140-38572-X / 978-0-14-038572-4. The records are for the 1988 cover (this record), the 1995 cover, and the 2008 cover which is also the current in-print cover. The Outsiders is about two weeks in the life of a 14-year-old boy. 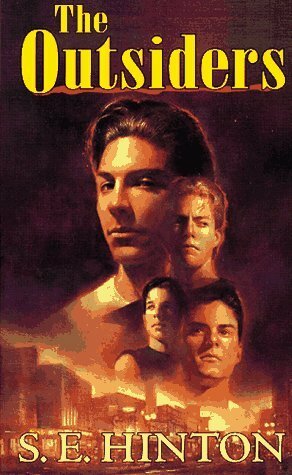 The novel tells the story of Ponyboy Curtis and his struggles with right and wrong in a society in which he believes that he is an outsider. According to Ponyboy, there are two kinds of people in the world: greasers and socs. A soc (short for "social") has money, can get away with just about anything, and has an attitude longer than a limousine. A greaser, on the other hand, always lives on the outside and needs to watch his back. Ponyboy is a greaser, and he's always been proud of it, even willing to rumble against a gang of socs for the sake of his fellow greasers--until one terrible night when his friend Johnny kills a soc. The murder gets under Ponyboy's skin, causing his bifurcated world to crumble and teaching him that pain feels the same whether a soc or a greaser.